Insurance Coverage for Homeowners Affected by Wildfire | The Voss Law Firm, P.C. Wildfires are a constant threat to people living and working in Texas. Since the only security homeowners have is their insurance policies, it pays to be extra careful when selecting wildfire coverage. Attorney Bill Voss explains what is and is not usually covered under standard fire insurance and how to select options that will fill in the gaps if a wildfire destroys your property. The first thing you should do is ensure that wildfires and forest fires are specifically named as an insured peril on your homeowners insurance. If they are not, it is wise to invest in a separate wildfire policy, especially if you live in an area that has been afflicted by brush fires in the past. The most basic policies should allow for the repair or replacement of the dwelling, plus coverage for additional living expenses (like rent, food, and transportation) during your evacuation and while your home is repaired. Personal property. If you have extremely valuable assets on the property, the policy limits you choose should be enough to replace the most expensive of your belongings. Other structures. This may be offered in addition to coverage of the family dwelling and pays to repair or rebuild unattached structures such as sheds, barns, or gazebos. Fire department charges. 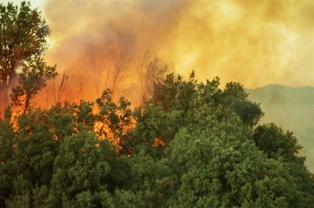 Most homeowners policies will include a certain amount for a portion of the service charges assessed by fire departments, but a wildfire can significantly increase these costs. Vandalism and theft. Houses are often vandalized before owners can return safely, and what little was not destroyed may have been carried off by thieves. Smoke and soot damage. Even if your home or belongings have been spared from the fire, they may retain smoke and soot damage that ruins their value. Landscape losses. Insurers may pay only a percentage of the loss of living plants on the property, including trees, shrubs, gardens, or greenhouse plants. Debris removal. Insurance companies may offer an endorsement for cleanup and debris removal, which is only the fraction of the costs in a large loss. Texas homeowners often pay more for coverage if they live in close proximity to known wildfire areas—and despite their high premiums, they are often denied coverage after a loss. Our attorneys can examine your policy and fight on your behalf to get you the full amount you are owed. Simply fill out the form on this page today to contact the Voss Law Firm or order a free copy of our book, Your Essential Guide to Residential Claims.